When it comes to home repairs, you should always choose a name you know and trust. As one of the most enduring brands in the US and Canada, Amana has stood the test of time for generations. Not only does the brand offer component upgrades for better performance and amazing warranties, but it also offer incredible efficiency with it’s AMVC96 or 95% AFUE rating. 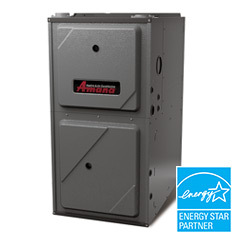 With Amana furnace installation and repairs from The Boiler Shoppe, you know that 96c out of every dollar spent on your energy bill, goes towards heating your home. There’s virtually no waste as you would experience with an older heating system. Need a new furnace? When your old heating system no longer works as it should, look no further than The Boiler Shoppe. As an accredited Amana Furnace Installation & Repair service specialist, you can rely on our team of qualified, experienced, and background checked heating technicians to identify and repair faults on your old furnace or to recommend and install a brand new Amana furnace. Regular maintenance will help ensure that your furnace continues to work efficiently to help reduce your heating costs and help avoid emergencies. Let The Boiler Shoppe tune up your furnace and help you prevent cracks in the furnace heat exchanger that may cause carbon monoxide gas to circulate through your home. When you need Amana furnace installation & repair services in the Greater Toronto Area, look no further than The Boiler Shoppe. We are accredited and experienced. We know the area like the palm of our hands and we’re standing by to assist you.